1) Virtual Ward Rounds and Consults help patients and clinicians alike feel supported and at ease with care. 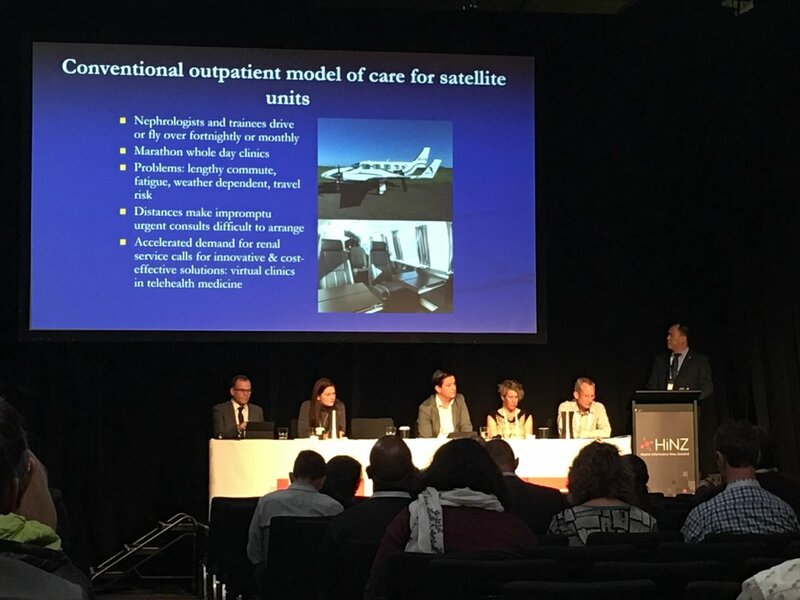 Dr Eddie Tan, nephrologist from Waikato Hospital, spoke about the “hub and spokes” model of care that Waikato Hospital and its satellite rural hospitals and clinics run. With hundreds of kilometres between sites, Dr Tan and his colleagues are on planes at least every fortnight for clinics that may last just a few hours before returning back to Waikato. This is problematic when rural patient emergencies develop; however, Telemedicine with videoconferencing to the satellite clinics has helped the Renal team conduct assessments, minus the hours and dollars spent on travel (and minus hours of patient/family stress). It has also prevented unnecessary hospital presentations, and brought critical patients to hospital sooner. Dr Tan’s colleague, Waikato District Health Board (DHB) renal nurse Jenny presented her research paper on how palliative care decisions were made easier with telehealth’s videoconferencing capabilities. This meant that difficult and time-critical family and patient conversations could be had in the comfort of the patient’s home, without wasting precious time in the potential final days of life arranging hours or even days of transport for the same consultation. Dialysis ward rounds also help Dr Tan assess end-stage renal patients who may deteriorate very rapidly and become fluid overloaded. Similarly, Rehabilitation ward rounds by telemedicine has helped patients in a rehabilitation ward feel happy and secure with their care. Registered Nurse and PhD candidate Sophie Gerrits’ research has so far found that rehab patients and staff at Thames Hospital, Waikato DHB New Zealand, are happy with the consults, and the elderly patients have adapted well to the new technology. The Ward Registrar goes from bed to bed with a telecart, and the Rehabilitation Physician or Geriatrician video-calls weekly in from the tertiary hospital, in addition to their usual weekly face-to-face visit. Staff appreciated having a second chance during the week to ask questions and raise issues that had arisen in the days since the last visit. The main issue to overcome was “patient jitters” at not knowing what to expect from a video consult and what was expected of them. This reinforces the need to counsel patients prior to a consult; that they can speak, behave and ask questions just as they would if the clinician was in the room with them. Yesterday, Dr Chris Bladin of the Victorian Telestroke Program discussed the very promising findings from the Victorian Telestroke Program research in rural hospitals, with hopes to expand to other Australian hospitals. Today, New Zealand Neurologist Dr Anna Ranta showed that since Telestroke has piloted from 3rd June in the Capital and Coast DHB, door-to-needle median time has reduced from 80 minutes down to 54. With cerebral ischaemia being a critical matter of seconds, this is a significant early finding, and along with other positive outcomes, will hopefully help push for a Telestroke rollout in other DHBs. 3) The finalists for the Sysmex Award for Health Informatics at the University of Auckland have promising ideas for mobile health applications. The winner, Daniel Surkalim, was announced tonight at the HiNZ Awards dinner. By creating visually appealing, simplistic views of patient data, his project, GRID(Graphical Relational Integrated Database) will help solve the clinician bugbear of “too much data, not enough sense” that occurs in many existing EMRs (electronic medical records). The other finalists deserve commendation for their work; Frances Toohey with Dr.Doctor for clinicians and patients to track eReferrals, and Kyle Frank’s MedScript to facilitate e-prescribing solutions for patients and doctors. 4) Tele-ophthalmology in India aims to cut waiting lists for a population short of ophthalmologists. Dr Sheila John of Chennai, India has done extensive work with diabetic retinopathy and machine learning, and inspired us with her dream to help rural villages be screened for diabetic retinopathy accurately and safely without a long waiting period for an eye specialist. Dr John quotes 60 million people in India as suffering from diabetes, with nearly 20% experiencing diabetic retinopathy, a cause of blindness if left untreated. With four events running this week, it’s impossible to catch all sessions at once. Watch the conference on demand, even after this week, with a Virtual Ticket, including one year’s worth of membership with HiNZand HIMSS Asia-Pacific, among other benefits. 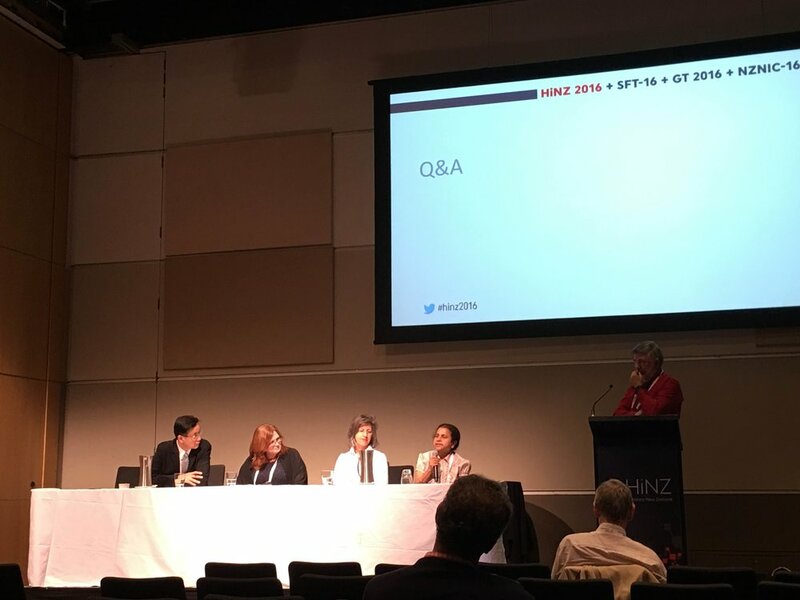 We thank HiNZ for providing media access to the conferences and truly enjoyed the experience.